Best dog behaviorist & private dog trainer in the SF Bay Area. Beverly is the founder of SF Dog Connect. She personally works with each of her clients one on one to help them with their dogs. She has extensive knowledge and success with solving aggression issues and helping shy, fearful dogs. Beverly has been working with dogs all her life. She has been educated in animal behavior as well as canine obedience and training. 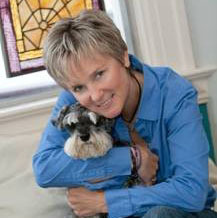 She has been serving the SF Bay Area as a dog behaviorist for over 13 years. Please watch this 3 minute video to find out about more about SF Dog Connect’s expert dog behaviorist. Beverly has helped over 2,500 dogs and their families during her over 13 years as San Francisco’s top rated dog trainer and behaviorist. She has formally evaluated and temperament tested hundreds of dogs for shelters and rescue groups as well as for dog-bite cases and hearings. She has trained dogs internationally. She has worked with the East Bay SPCA, Pets Unlimited, SF ACC, P.A.W.S., and various rescue organizations. Beverly is certified with the American Kennel Club as an evaluator for its Canine Good Citizen Test. She is on the Board of Directors of Rocket Dog Rescue as well as Share-A-Pet (SAP) pet assisted therapy organization. SAP hired Beverly to be its San Francisco area trainer and tester for its Therapy Obedience Professional (TOP) testing for all the therapy dogs involved in SAP. She was also the sole behaviorist for Veterinary Street Outreach Services (Vet SOS) and continues to train PAWS (Pets are Wonderful Support) volunteers and provide free services to PAWS’ clients. She comes highly recommended by Pets Unlimited, San Francisco Dog Owners Group, The Milo Foundation, Reunion Rescue, Rocket Dog Rescue and Home at Last Rescue – and she has fostered and/or trained dogs for each of them. Beverly has been a member of the Association of Pet Dog Trainers and the International Association of Canine Professionals for over 12 years. Her excellent training capabilities have also enabled her to be featured on various TV and news programs. But, most importantly, Beverly loves dogs and speaks their language. She wants to help you better connect with your dog.